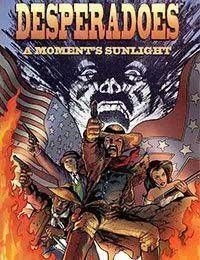 In the critically acclaimed DESPERADOES: A MOMENTS SUNLIGHT, an engrossing story and breathtaking artwork are combined to create a supernatural western tale of horror. On the run from the law in the late 1800s, four wrongly accused cowboys arrive in the New Mexico territory where a serial killer is ritualistically skinning half-breed children and slaughtering their mothers. Now with the murderer gaining new supernatural powers with each killing, the four outlaws must find a way to stop the mysterious madman and avert a bloody war between the white settlers and the Indian tribes.